You are currently working at Swisscom as a Senior Scientist in Data, Analytics & AI. What’s your role at Swisscom and what kind of projects are you currently working on? I am a senior data scientist part of the Data, Analytics & AI group at Swisscom, working in a multidisciplinary team with several other data scientists, developers and business analysts to create valuable insights from different data sources and to deliver best service experience to our customers. In order to achieve this goal, we build automated solutions that reduce processing time while preserving high quality services. I am currently involved in one of the most exciting projects at Swisscom in which we use advanced machine learning and natural language processing techniques to (1) analyse more than half a million customer written requests per year; (2) to route them to the right agents; (3) to classify them based on appropriate intents; and finally (4) to provide automatic answers to some simple requests. How are projects usually structured? Do people work in a team in your company and how does the composition of an analytics/data science team look like? We are using agile methodology and working in squads that are mainly project based. This means that based on the project that we are involved, we make new squads and work together. The squads are usually multidisciplinary and composed of different skills. On the one hand, data scientists work closely with developers, software engineers, data engineers and architects to implement their own solutions and bring them to the production. On the other hand, they have direct interactions with knowledge experts and business analysts to validate their results and compute their business impact. 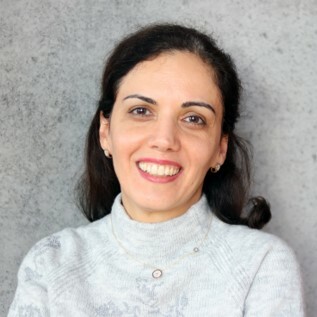 Fatemeh is a senior data scientist at the Data, Analytics & AI group at Swisscom. As part of a multidisciplinary team, she creates insights from large data sets. Fatemeh holds a Ph.D. in Computer Science from EPFL. Prior to joining Swisscom, she was working in applied science research at HEIG-VD. DataCareer Insights is an interview series that features experts working in the field of Data Science, Data Analytics, Business Intelligence, Data Engineering and related fields. It provides valuable insights to students and professionals interested in entering the field or thinking about the next career step. Interested in contributing your insights? Contact us! Before joining Swisscom, you were working in academia at the EPFL in Lausanne and at HEIG-VD. What motivated you to start a career in the private sector in data analytics and AI? During my Ph.D. at EPFL (2006-2011), I was very focused on fundamental science and was working on designing new algorithms for distributed systems and proving that they are correct and performant. I was confronted with applied science at HEIG-VD (2012-2015) and figured out how science can be useful in everyday life. Analysing massive amount of data in an efficient way and making sense of big noisy data fascinated me even more in the applied science field. I followed several online courses both in big data, machine learning and text mining and decided to continue my career in this amazing area. Here at Swisscom, we have both, a large enough set of real data to investigate, as well as stimulating problems where the goal is to make people’s life easier. What excites you most when working with data? The data scientist job is a multidisciplinary job. You work with different people with different backgrounds and learn a lot of things together and grow together. Also, I like the diversity that exists in data science tasks. Depending on the project that you are involved in, the domain knowledge can vary completely. Which skills would you regard as vital in your current role and which technologies are you primarily using? We use open source technologies as much as possible. For prototyping, either Python or Scala Spark are popular depending where data resides. In production, depending on the application, Scala Spark is mainly used for ETL tasks and batch processing, otherwise, Java and Python microservices are very common. In my position, soft skills are as important as the technical skills, such as, ability to understand business needs, to communicate with non-technical people, to collaborate within and across teams, as well as, caring about how internal processes can be optimized, and how business needs can be translated to technical know-how. Data science is a quickly moving field. How do you keep up to date and which online or offline sources are you using? At Swisscom we have the tradition of organising some training courses internally, as well as organizing different community of practices (CoP). Specially in the data science CoP, we organize regular reading groups in which participants discuss the most recent academic papers or technologies and challenge how and why they can be useful in our projects. Swisscom offers 5 days of professional development per year in which you can attend a conference, workshop or training and stay up-to-date. Furthermore, Swisscom just started a new collaboration with the EPFL Extension School and offers data training courses for data novices as well as data professionals. In the pilot project, 100 Swisscom collaborators can attend a course and the company covers the costs. Each course leads to an EPFL certificate of completion or an EPFL Certificate of Open Studies - an officially recognized academic qualification. Which three pieces of advice would you give to aspiring data scientists? Talk to the domain experts in your company and try to understand their problems and needs, translate those needs to scientific problems, develop scientific solutions and analyse the equivalent business value with your business partners. Start with simple solutions and add complexity only if needed. When developing new solutions, think twice about operation and long-term maintenance. Try to find an answer to the question "why this is happening" instead of only predicting what is going to happen! Swisscom, Switzerland’s leading telecom company and one of its leading IT companies, is headquartered in Ittigen, close to the capital city Berne. Outside Switzerland, Swisscom has a presence on the Italian market in the guise of Fastweb. About 20,000 employees generated sales of CHF 8.7 billion in the first nine months of 2018. It is 51% Confederation-owned and is one of Switzerland’s most sustainable and innovative companies.